Signing the likes of Tracey Porter and Jason Hatcher, and even one of my favourite under-the-radar linebackers Daryl Sharpton were all good off-season business for the Washington Redskins, but the moves lacked that big splash. That splash, well more like a tidal wave, eventually came earlier this week when the Redskins invited recently released former Philadelphia Eagles wide-out DeSean Jackson, better known as D-Jax, for a visit to Fed Ex Field. They knew how important the visit was, and as a result said enough sweet nothings into Jackson’s shell-likes, making sure he did nor leave until he signed on the dotted line. Being a lifelong Redskins fan I have had my fair share of low-lights in the past 20 years, including a stretch where bitter division rivals the Eagles were the class of the division. I have also witnessed two Super Bowl wins by another division rival the New York Giants in the last ten years, wins by a combined seven points. Some divisional players have been a real thorn in the Redskins side, from Brian Westbrook to DeSean Jackson. Signing one of these prickly pears is a real relief, as it means one less speedster to man mark. I think DeAngelo Hall will lose less sleep over covering Riley Cooper that he will against D-Jax. The Redskins combination of wide receivers now moves from top 20 to top 10 in one signing. Jackson will be a spectacular #2 to accompany Pierre Garcon (the NFL leader in catches in 2013), and they will both be joined by another new signing, former Arizona Cardinals number 3, Andre Roberts. Robert Griffin III will be a happy man, but he does have some extra pressure now as he has needy wide-outs wherever he looks. This is a nice problem to have for any NFL quarterback, but for RG3 he does not strike me as a 4,250 yard (or more) passer so I am not expecting a stat line for Jackson that will not get close to his 2013 output of 82-1332 and nine touchdowns. I will predict a decent 70-850-5td stat line, as RG3 and Alfred Morris will be pounding the pigskin, and the nest of birds (including a former Eagle and Cardinal) will be cheeping loudly for the ball. One of those making the noise will be Jordan Reed the tight-end who has the potential to be a Pro-Bowler in his second season if he plays for the full season. It’s not a legitimate off-season in the NFL until the Redskins make a big move, and I feel a lot more optimistic that 2013 was irregular and 2012 was what we will aim to beat in terms of 10 wins. 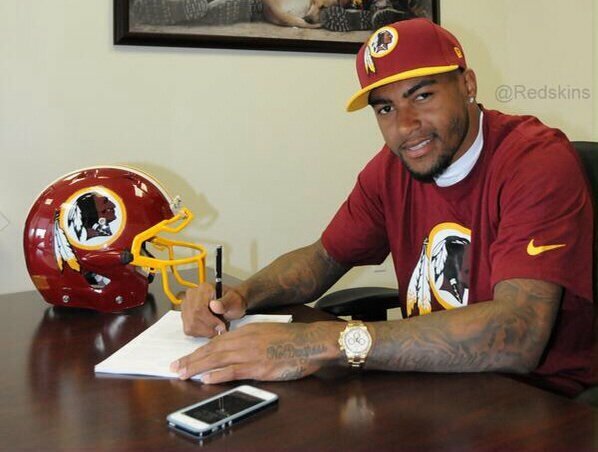 The number I love the most out of this is not #10, which D-Jax has absolutely no hope of wearing in 2014, its 17.2. That is the lifetime yards per catch average of DeSean Jackson. 17.2 yards per catch is phenomenal. Maintaining this average in burgundy and gold will mean a phenomenal season for D-Jax and a big bag of wins. This move also makes up for a lack of no first round draft pick this season, better the devil you know right? Lets hope Jackson’s former team mates don’t gang up on him when he faces the Eagles twice in the 2014 season, after all that wont be a good sign.